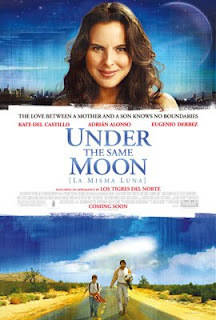 Following in the footsteps of Cinema Paradiso and Il Postino, Under the Same Moon (La Misma Luna), is an uplifting, heartwarming drama about a 9 year old Mexican boy named Carlitos (Adrian Alonso), who after the death of his grandmother decides to cross the border into America in search of his mother (Kate del Castillo) who is working there illegally to support him. It is a beautiful and wholly innocent premise that is loaded with political controversy. With heated debate about illegal Mexican immigrants currently raging in our public square, Under the Same Moon attempts to put a human face on an issue that many feel passionately about, but few have any personal connection to. The film largely (and wisely) shies away from politics, but makes a few choice digs at Arnold Schwartznegger's veto of a bill allowing illegal immigrants to obtain driver's licenses, courtesy of some radio deejays, and offers up some pointed song lyrics about America's prejudice against Mexican immigrants. For the most part, however, the film is largely apolitical. The focus here is on the human side of an issue that is very easy to dehumanize if held at arm's length. It's a new twist on a plot we've all seen before, but director Patricia Riggen handles it very well. We know where this is going from moment one, and could probably chart the storyline beforehand to relative accuracy, but Riggen directs with a compassion and grace, and young Alonso carries the movie with such charm and sincerity, that it is hard not to like. Alonso is without a doubt the film's strongest asset - he single-handedly carries the entire film on his shoulders, and comes out with one of the finest performances by a child actor I have ever seen. He is magnetic and wholly believable. The writing may periodically fail him, but he never falters. Alonso is a talent to watch, and I hope to see more work from him in the future. If this is any indication, he has quite a career ahead of him. Under the Same Moon may be predictable and sentimental, but it's impossible to question its conviction. It's got a heart as big as the moon, and succeeds in its goals far better than the similarly themed August Rush, which was maudlin and manipulative, whereas Under the Same Moon is touching and warmhearted. That can only get you so far of course, but in this case it goes a long way. I really want to see this, it sounds good enough. It's definitely worth seeing if you enjoy this type of thing. People who can't stand sentimentality, no matter how well done it is, should give it a wide berth. I do not mind sentimentality at all, if it is not overdone. If it is genuine and heartfelt, I adore it. I have heard good things about this film indeed and I am in. Under the Same Moon believes in the good in people as well as the mother/son connection. I think it was beautifully done.